It was a bottle bought by the restaurant over 5 years ago and had been forgotten about. It was a bottle of Johnnie Walker Green Label. Now you might be wondering whats so exciting about that. 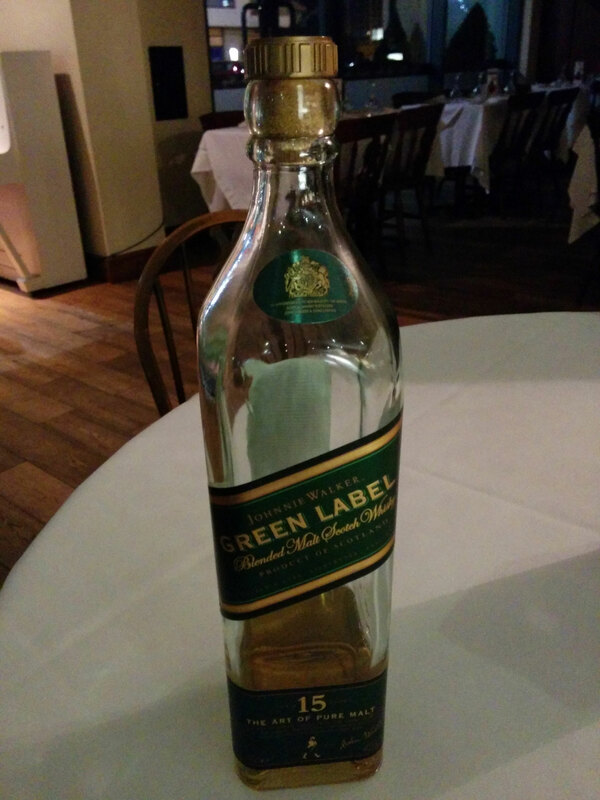 Well its not only the fact that Johnnie Walker Green Label has been discontinued but also the fact that the majority of the bottles have either been consumed or sold to collectors. I was a little too young for whiskey when it was discontinued and never expected to be able to ever try it so this was a real treat for me. Johnnie Walker Green Label is made from four whiskeys from different corners of Scotland. Each aged for a minimum of 15 years and chosen for their unique superior taste. Talisker brings power and depth of character, Caol Ila adds intensity, and at its heart Cragganmore provides a sweet maltiness, while Linkwood adds a final touch of finesse. Green Label has a rich gold amber appearance. As you drink it, it takes you on a journey across the Scotland. Starting with a taste that I can only describe as the taste of fresh ocean breeze, followed by a peaty taste with pine. Then as these flavours fade it further dissolves leaving you with exotic notes of orange peel, stewed peaches, cooked black fruits and sour cherry. Johnnie Walker Green Label is great and if you can get a bottle I recommend keeping one just in case you need to escape for a while. It’s difficult to put a price on something that is no longer available but I have seen Johnnie Walker Green label available from £100 upwards. I suspect the price will slowly creep up as it becomes harder to find. Posted: 08/04/2014 08/04/2014 . Tagged: Blended, Green Label, Johnnie Walker, Journey, malt, Scotch, Scotland, tasting, whiskey. Bookmark the permalink.